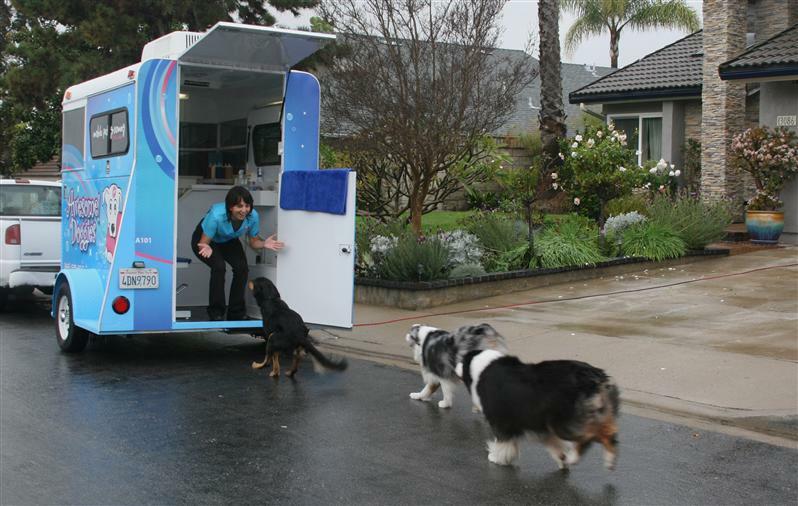 Ten Reasons To Use A Mobile Dog Groomer…. …And How To Chose The Best One. If your dog isn’t completely happy going to the groomer or if you just want to make it easier for both you and your dog, mobile grooming is a good alternative choice you may want to consider. With mobile grooming, you don’t even have to leave your home and this will help your pet to remain more calm and stress-free during grooming, seeing how he or she will be in a familiar environment. In addition, some dogs get car-sick or have other problems riding in a vehicle; this will completely eliminate the need for a ride to the groomers. Of course, mobile grooming does cost a bit more than regular groomers, but there are plenty of reasons why it’s worth every extra dollar. Because some mobile groomers cost quite a bit more, you may need to be convinced of the benefits of using this more expensive service. Maybe you’re just curious about the differences between the two types of grooming so you can decide which is best for your pup. Either way, we decided to compile ten reasons to use a mobile groomer. The groomer comes to your home or office/place of business, so it is very convenient. Whether your dog gets car-sick, doesn’t like the groomers, or you just want the convenience mobile grooming offers, this is a wonderful choice. Or perhaps you are too busy to run your dog to the groomers, leave him, and then go back and pick him up. This way, it’s only one time, one trip, and you’re not even the one who has to take the trip! Mobile grooming is definitely convenient. It causes less stress for both your dog and you. You don’t have to worry about getting your pet around other people or pets or how the groomer is treating your dog. Your dog won’t be nearly as stressed since he’ll still be at home- in that safe and familiar environment that s\he is used to. Additionally, you can stay with your pet the entire time if your being there doesn’t distract the dog too much. Less stress equals a healthier, happier, and cleaner pet! There’s no exposure to other animals. You don’t have to worry about your dog picking up diseases or parasites from other pets. You don’t have to worry that someone’s dog may be bigger and a bully. Also, you won’t have to worry that your dog isn’t being carefully watched at all times, as well as the other pets being watched, too. You won’t have to worry about any of this, because such a situation just does not arise. With mobile grooming, your dog will always get one on one personal care and attention. There’s no waiting. There’s no times when your dog is left unattended. Your dog will receive one hundred percent attention from the groomer because s/he’ll be the only one there! All the services will be performed consecutively instead sporadically. Your dog won’t be put in a cage before, during, or after grooming. Instead, he’s always out in the open, constantly being groomed for the length of the session. In addition, you never have to worry about what size crate or cage he’s housed in while waiting to be groomed or wonder if he’s been given water and being walked. There’s no cage drying! You won’t have to worry about the controversial cage drying, because mobile groomers hand air dry all pets being groomed. Not only isn’t there enough room, but it’s just not feasible to have a cage dryer in the back of a grooming van. You’ll never have to worry about your pup getting to hot or burned. He’ll never even be out of your sight! Mobile groomers don’t use tranquilizers to sedate pets for grooming because they are generally a lot more calm when being groomed at home. Although it is illegal in some states, there are still groomers who choose to sedate bigger breeds or hyper dogs so that it’s easier for them to groom them. It certainly may not be what’s best for the dog and you should be the only one to make that decision. You can get evening and weekend appointments. 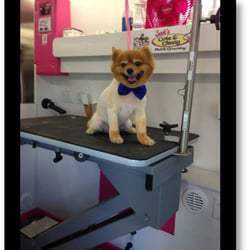 Most mobile groomers provide many hours which regular groomers wouldn’t be able to. If you work all week and don’t have time for grooming, then you can get a weekend appointment. If you always work 9-5, and need an evening appointment, one can be arranged. There’s no inconvenient drop off and pick up times. They come to you! It’s all done at the same time. Instead of having to put aside enough time for travel, waiting, dropping off, and picking up, a mobile groomer makes it more convenient in addition to saving time. It’s just easier for both you and the dog. In order to eliminate separation anxiety, you’re allowed to stay with your dog. This is good for many reasons, including your pet’s stress level. You can see how the groomer is with your dog, see how he is being treated, and see exactly what the groomer is doing to him. If you have any objections or if you’re dog gets scared, you’re right there! 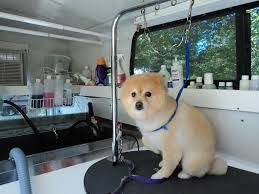 Ask around- ask your friends, relatives, and veterinarian for recommendations of mobile groomers. In addition, you can Google ‘’mobile dog groomers in [your area]’’ to find out what’s close. Do research- always check customer reviews and feedback, whether online or otherwise. Call the groomer(s) you have in mind to schedule a time to talk; they may be busy when you call. Ask about certifications, whether they are licensed and bonded, and if they’re familiar with your type of dog. Discuss any potential problems you feel need to be addressed. Go with your intuition! If something seems off, it probably is! Once you’ve chosen a mobile groomer, make sure to see proof of any certificates, licenses, or other documents. Also, check the interior of the grooming van to ensure it’s a safe, sanitary, and healthy environment before allowing your dog to enter. If you follow these suggestions, you should be able to find a mobile groomer that will suit you and your dog’s needs. Instead of dreading grooming time, you both just may start looking forward to it!